It forms in the autumn of 2007. It starts operations based on the nightclub of Tokyo. 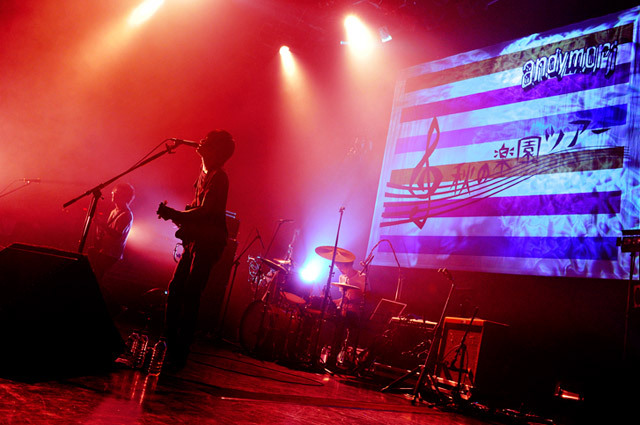 The formation is adjusted to one year and 1st EP “Andy, lock, Bengal tiger, and whisky” is released on October 8, 2008. A lot of echoes will be obtained in another place at persons in question’ one’s own paces. 1st album”andymori” is released on February 4 in the case 2009 when live appearance has increased rapidly. It becomes a record where their freedom and hope are tightly blocked according to the self title. They spring up to the scene with a melody can drink by Lyric and the edge caught by an original aspect as the weapon that misses momentary exploding sound and somewhere, and is certain. First, one-man live “[Shimokitasawadei;-mori]” is held performing to various live events with Shimo-Kitazawa basement bar in summer. The event of the same name is sponsored for three months. Moreover, it performs to large-scale festivals such as Hasunuma FES, ROCK IN JAPAN FES, SUMMER SONIC, and SWEET LOVE SHOWER. Their music resounded in violence in various places in the summer of 2009. In addition, one-man live “SAWASDEECLAP YOUR HANDS” is dared in Ebisu LIQUID ROOM on October 15. A large flourishing business more than the expectation of this and persons in question is shown. 2nd album “Fanfare and excitement” is released from 1st album on February 3, 2010 after just one year. The first nationwide one-man tour of the album sale commemoration is all halls SOLD OUT including an additional performance. It participates in 11 Fez and events in summer, and Tomei [**] one-man tour ‘We [andei;mori]’ of the compilation in 2010 is held in autumn. The performance with the first Hibiya outdoors large music temple of a tour final day is SOLD OUT. The secession of Taiki Goto of the drum is notified while this.. performing. It has live in Kichijoji CLUB SEATA November 27, 2010 and it secedes. New drummer ‘Kenji Okayama’ formal joins from live of Shimo-Kitazawa SHELTER on December 2, 2010. It is already a band, and in haste, a fresh initial, impulsive sense is taken according to this timing and the thing that was able to be returned is terrible and a big harvest of it for the band though it was a decided formal joining. The great hope and light were able to be seen the activity in the future. A one-man ‘Paradise of spring’ tour in 10 cities across the country is held in May. I felt certain response of newborn andymori with audience. 3rd album “Revolution” is released on June 8, 2011. After it joins of Kenji Okayama, it is recorded instantly, and it makes to the man admiration song that approaches radically in a simple word, and the reformation work. This is 1st album of the location named 3rd album. 9. “3rd album ‘Revolution’ sale one-man commemoration ‘Paradise of autumn’ tour” in 10 cities across the country has been decided in October, too.